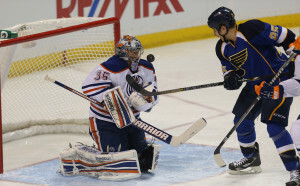 40 year old goalie Nikolai Khabibulin, playing in only his seventh game of the season, stole one from the St. Louis Blues, making 43 saves for his 46th career shutout to lead the Oilers to a 3-0 win at Scottrade Center. Khabibulin made save after save all night, including 21 in the second period alone. It was the first time he’s blanked the Blues in 47 career starts against them. It was redemption for the Oilers, who had lost twice to the Blues this month. They lost 4-2 in St. Louis on March 1 and lost 3-0 at Rexall Place this past Saturday. Jordan Eberle and Taylor Hall each had three-point games, with Eberle picking up two goals and Hall scoring once. Two of those goals came in the second period, despite being outshot by the Blues 21-5. The Oilers scored twice to take a 3-0 lead just 5:17 into the second period. Ryan Nugent-Hopkins had two assists and the Oilers (12-13-7) snapped a three-game winless streak. Edmonton also won for the first time in St. Louis in seven games dating back to a 5-3 win Dec. 11, 2009. Jake Allen started the game, but was pulled after making just four saves on seven shots. Jaroslav Halak was called on and made 12 saves the rest of the way out. After the game, coach Ken Hitchcock did not meet with the media for over an hour. When he came out of his office, his message was simple.